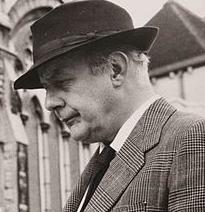 Sir John Betjeman, CBE (28 August 1906 – 19 May 1984) was an English poet, writer, and broadcaster who described himself in Who's Who as a "poet and hack". He was Poet Laureate of the United Kingdom from 1972 until his death. He was a founding member of the Victorian Society and a passionate defender of Victorian architecture. He began his career as a journalist and ended it as one of the most popular British Poets Laureate and a much-loved figure on British television. Cavan Wood has been a Head of RE since 1993. He has written textbooks for Heinemann on Judaism and Buddhism as well as for the Think RE series. He is a regular contributor to Secondary Assembly File and a reader in the Church of England. Tickets are free, however, tickets are allocated due to limitations on seating capacity. Please register your place below.